His Beatitude, Patriarch Ignatius IV (Hazim) of Antioch and All the East, reposed on December 5, 2012. His Beatitude Patriarch Ignatius IV (Hazim) of Antioch and All the East was born in 1920 in the village of Muharda, near the city of Hama Syria. In 1936, he moved to Beirut, where he became an altar server. Years later, upon taking monastic vows, he became a hierodeacon. In 1945 he graduated from the American University of Beirut, and from 1949 to 1953 studied at the Saint Sergius Theological Institute in Paris. On his return to Lebanon, the young theologian with a master’s degree was ordained hieromonk. In 1942, he became one of the founders of the influential Orthodox Youth Movement in Lebanon and Syria, which has done much to renew youthful participation in Church life. In 1953, His Beatitude became one of the organizers of Syndesmos the worldwide Brotherhood of Orthodox Youth. In 1961 he was ordained Bishop of Palmyra and Patriarchal Vicar, and in the following year, he was sent to the monastery of Balamand as superior and as dean of the Theological Seminary founded, which in 1988 was transformed into an Orthodox University, the first in the Middle East. He has published a series of theological books and numerous articles. His Beatitude is an honorary doctor of Sorbonne and Saint Petersburg (1981) and Minsk (2003) Theological Academies. In 1970, the future Patriarch was appointed Metropolitan of Latakia (Laodicea). On 2 July 1979, he was elected Primate of the Church of Antioch and enthroned on 8 July of the same year. I have been grieved to learn about the demise of the long-standing Primate of the Most Holy Church of Antioch, His Beatitude Patriarch Ignatius IV of Great Antioch and All the East. On behalf of the hierarchs, clergy, monastics and laity of the Russian Orthodox Church and on my own behalf I would like to express profound condolences over the bereavement of the Orthodox Church of Antioch. Blissfully departed Patriarch Ignatius has been at the helm of the Most Holy Church of Antioch in a period of severe trials that have befallen to her lot. His biblical wisdom and profound Christian humbleness have made him one of the outstanding religious leaders of today. He worked much for peace and wellbeing in the old land of the East. Working for the spiritual nourishment of his flock, he was a model of ardent worker in the field of Christ and tireless devotee who gained the church people’s love and respect not only in Antioch but also far beyond it. We are mourning together with you over the demise of His Beatitude Patriarch Ignatius, who was a friend of the Russian Orthodox Church for many years, following the age-old tradition of fraternal cooperation between the ancient Antioch and Holy Russia. As one who has been connected with the deceased by long-standing bonds of personal friendship, I remember with heartfelt warmth our recent talks in Syria and Lebanon. I ardently pray for the repose of the soul of the Blissfully Departed Patriarch Ignatius in the bright place of light, in the place of rest whence all pain, sorrow and sighing have fled away and for his inclusion in the assembly of the elected of Christ. May His Beatitude Patriarch Ignatius of eternal memory be an intercessor for his people and for all the Orthodox Christians at the Throne of God, dwelling in the mansions of the righteous. Eternal and blessed memory to him! Deeply grieved to learn about the demise of His Beatitude Patriarch Ignatius IV of Great Antioch and All the East, I would like to express to you my sincere condolences over the great bereavement that has befallen the fraternal Church of Antioch. For many years His Beatitude Patriarch Ignatius was a true father for many thousands of the faithful of the Patriarchate of Antioch who live today in all the inhabited continents, for in the years of his patriarchal office the Orthodox Church of Antioch has brought the preaching once initiated by Sts Peter and Paul in Damascus even to the end of the earth (Acts. 1:8). Divine Providence is seen in that precisely such a man as His Beatitude Patriarch Ignatius was at the helm of the Church of Antioch in a period of severe trials that befell her in the late 20th century and God’s blessing in that His Beatitude steadfastly steered the church boat into a safe harbour through the perturbed sea of life. 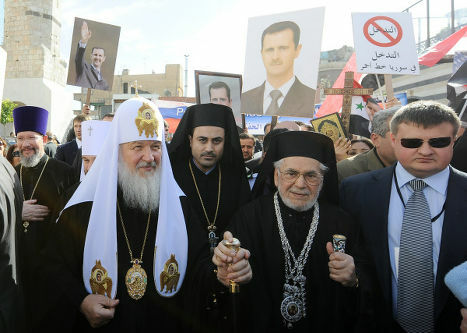 The concern His Beatitude Patriarch Ignatius showed for the prosperity of the old Throne of Antioch, for peace and wellbeing in the lands of Syria and Lebanon as well as throughout the Biblical region has gained His Beatitude honour and respect among the Christian public at large. The deceased worked much to consolidate the unity of Orthodoxy. By his deeds for the glory of God His Beatitude has raised the authority of the Most Holy Church of Antioch in the Orthodox world. He was a faithful friend of the Russian Orthodox Church in which he is well known and loved. Therefore, mourning together with us today and praying for the repose of his soul are many hierarchs and lay people of the Moscow Patriarchate. I remember with warmth and reverence the moments of my personal talks with His Beatitude Patriarch Ignatius and witnessed on many occasions his truly biblical wisdom and erudition, high dignity and at the same time his heart’s simplicity, generosity and love. Sharing the grief of the Most Holy Church of Antioch over the demise of her Primate, I pray to All-Merciful God that He may give rest to the soul of the blissfully departed Patriarch Ignatius in the mansions of the righteous and make his memory eternal. At virtually every liturgical celebration, we pray for “a Christian ending to our lives, painless, blameless, and peaceful.” It is in this spirit that I write, on behalf of the Holy Synod of Bishops and the clergy and faithful of the Orthodox Church in America, to share our deep sorrow upon learning of the repose of His Beatitude, Patriarch Ignatius of Antioch and All the East, and to assure you of our earnest prayers for his repose, that his soul might ‘shine like the stars of heaven’ as he in born into the eternal Kingdom. Patriarch Ignatius’ ministry as a hierarch and shepherd, an author, and an advocate for the youth of the Church is well known and stands at the heart of the legacy he leaves, not only for the venerable See of Antioch, but for the entire Church. His writings have inspired countless faithful the world over. The encouragement he offered to the Church’s youth — touching many souls not only within the Patriarchate, but likewise through his involvement in and support of Syndesmos, the World Fellowship of Orthodox Youth — has been a witness to his concern for the Church’s future, as well as her present, well being. But above all, like his saintly predecessor and namesake Ignatius of Antioch, Patriarch Ignatius has reflected throughout his life the very image of the Good Shepherd, faithfully tending to that portion of the Flock entrusted to his care at all times and in every circumstance, good and bad alike. The tenacity of his faith in the One Who is Love Itself has provided comfort to countless souls, especially in recent times, as the Church has faced, and continues to face, unprecedented challenges. He has distinguished himself as one who has fully embraced our Lord’s words, “Do not be afraid,” for which he now receives the crown of victory. Please be assured of our prayers for Patriarch Ignatius’ repose, as well as for the consolation of the hierarchs, clergy and faithful of the beloved Church of Antioch. Your sorrow is our sorrow; your hope is our hope. And may the joy of the “blessedness of the Kingdom,” in which Patriarch Ignatius now delights, consume us now and in the days to come. 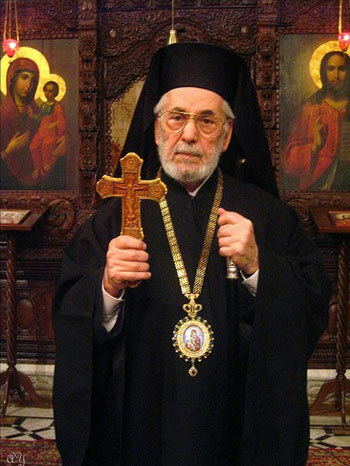 The death of Patriarch Ignatius is a great loss for the entire Orthodox world. 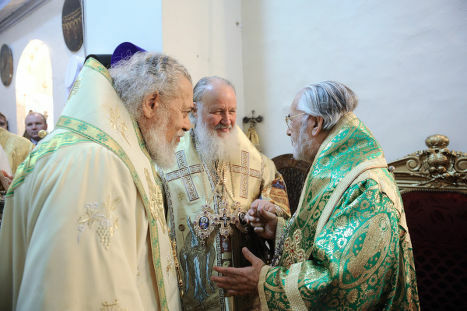 The Lord prolonged the years of Patriarch Ignatius’ life to develop relations among the Churches, and above all among the Orthodox Churches. He played a significant role on the international stage, representing the Patriarchate of Antioch at the World Council of Churches. The fact that we have excellent relations with the Russian Orthodox Church is an unquestionable achievement of Patriarch Ignatius. Patriarch Ignatius was a personality: father, true pastor, outstanding theologian and preacher, and author of many books. He had ideas about everything going on in the world. Communication with him was always interesting: he possessed mind and culture, yet all the while was an open, simple, and cheerful person. The Patriarch never had money in his pocket; he lived on what was donated to him. When travelling he would wash his own shirt in the hotel. Arranging an appointment with the Patriarch was not difficult; anyone could turn to him with any question, although in recent years the Patriarch, because of his age, was able to receive fewer people than usual.